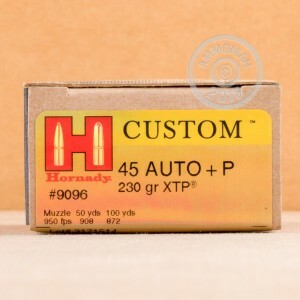 This 45 ACP +P ammo by Hornady has all of the reliability and power you need in a self-protection scenario. The 230 grain XTP projectile has a jacketed hollow point that lives up to the name "Extreme Terminal Performance" by expanding on contact and destroying soft tissue, organs, and bone. The muzzle velocity of this cartridge is 950 fps. Each 45 ACP cartridge in this box of 200 underwent rigorous quality inspection before being shipped from Hornady's Nebraska factory. Hornady picks the best casings, powders, and primers that will compliment each other's performance, providing you with the some of the best factory loaded ammo on the market. These cartridge have Boxer-primed brass casings that are reloadable. Since 1949, Hornady has established itself as a leader in the ammunition industry. 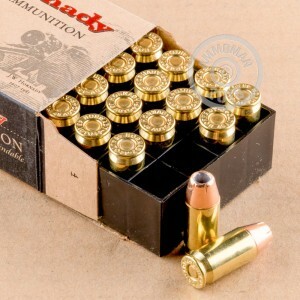 This 45 ACP ammo is manufactured using state-of-the-art machinery and quality assurance practices. 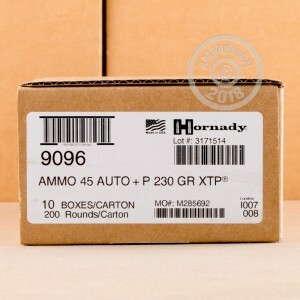 Enjoy free shipping when you order your 200-round case of this premium self defense ammo today! *Please note, this is high pressure ammunition and may not be safe to shoot in all firearms chambered for this caliber. Always check with the manufacturer of your weapon if you are unsure.